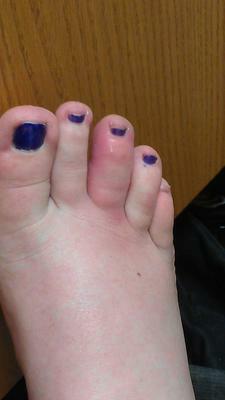 About a week ago, on my right foot my 3rd toe suddenly started getting really sore and swelled up and is red. It's so swollen that I can't even bend it, and the pain is starting to get worse. The pain goes down the back of my foot to the ball of my foot straight down from where my toe is. I have been putting ice on it and soaking it in Epson Salt to hopefully to get it better, but its seems to be getting worse.What could this be and how can I get it to go away?? Since you do not mention any history of trauma, the two things that come to mind are either an infection or an inflammatory flare up within the toe. Judging by your foot you appear to be relatively young so I would be more inclined to think infection rather than inflammatory disease. Most cases of a toe infection which would encompass the whole toe would generally come from an infection from in between the toes, usually secondary to athletes foot which has become secondarily infected with bacteria. Look between the toes on either side and see if that is not the case. As long as you are looking, take a peek underneath the toe to make sure there is no crack in the skin. This too could become infected and cause the toe to become red and swollen. me to tell by looking at the picture but the nail seems to be alright. So, if it is not an infection then the next condition you have to consider is one of inflammation from one of the so called arthritic diseases. Most of these conditions will affect one of the two joints in the toe, inflaming them and causing the toe to swell and become painful; rarely does the toe get as red as your appears to be. One exception would be a gout attack which is an accumulation of uric acid in one of the joints and that certainly can cause a toe to become painful, red and swollen. The problem here is that gout rarely occurs in pre-menopausal women and because of the nail polish and what I perceive to be a young person, gout would not be my first choice. If this is an arthritic flare up of some sort, there is a chance it may resolve itself in a few days. The problem is, it may also be an infection and the chances of an infection clearing itself up is fairly remote. In fact I would assume if it is an infection, it may actually further worsen. Unless you forgot that you stubbed your toe or accidently dropped something on it, then you will need to see a doctor who should be able to make an accurate diagnosis and offer treatment. That is the proper way to treat this problem. Did you get this sorted? I have a similar looking toe and the itching is driving me mad. My googling kept coming back to chilblains.